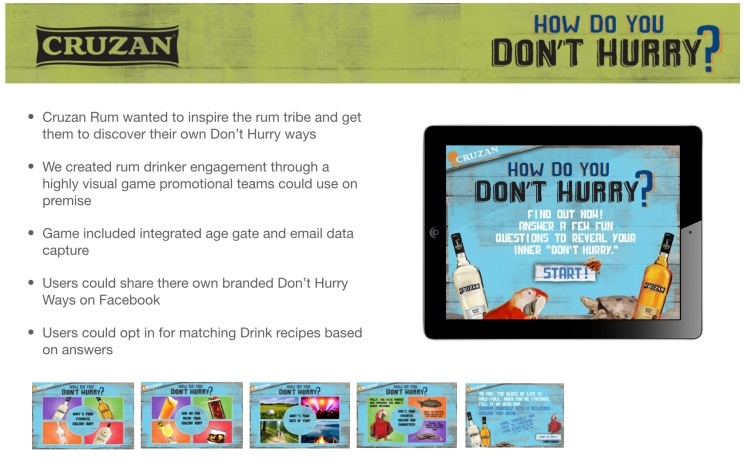 Cruzan Rum wanted to engage customers at retail, entertain and capture valuable consumer data including drink preferences, email addresses, social interests. The Don’t Hurry Game is a high performance web app with a highly visual interface that allowed potential rum customers to figure out what kind of rum drinker they are. Promotional teams incorporated the game into on premise promotions awarding participants. Customers can also share the results with friends on Facebook.